Our friend Sarah, who comes and looks after Charlene and Co when we step out of town, dubbed these little Easterbrooks "The Kitten Ninjas". She was here taking care of everyone when we were in Portland a couple of weekends ago. In the kitten room, there's a closet that has curtains instead of doors. The kittens love sleeping in there. It's dark and cozy and there are lots of little nooks and spots to cuddle up in, like the sock box and sweater cubbies, for example. If you enter the kitten room while they're napping, it's quiet and the room feels empty. Then, one by one, from behind the drapes, these stealth kittens drop out of the closet and land with a soft thud on the hardwood floor. They're always a little bit dazed, because just seconds before they were sound asleep, so they stand frozen in the positions they landed in while they wake up and figure out what's going on. Posed in their little black coats, they look just like little kitten ninjas. Loveable ninjas - in this case, certainly not an oxymoron! I agree with daywoods2. Can we get a video of this? When they try their kitty fighting. They are SO adorable in the photo! Such teensy fierceness, gotta love it! And yes, we need photos of them as ninjas coming out of the closet -- I'm sure there would be even more adorableness! Uh oh, tiny ninja Norma is about to pounce! 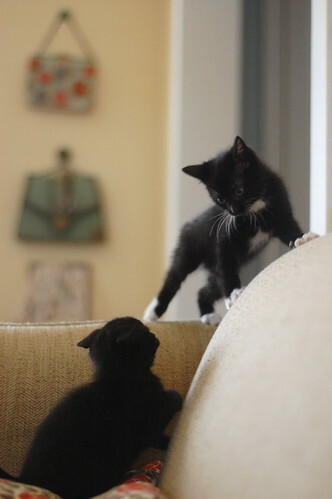 Is the very graceful little ninja tux Astrid or Thurston? They look so much alike, I honestly can't tell in this picture! Either way: adorable! Aw, yay for Sarah! She takes care of my cats too. Kitten Ninjas is such a perfect term for these little guys. Or is it ninja kittens??? Or....help me figure it out, Charlene!!!! What ever you call them, the little ones are beautiful. I have one, but he grew up to become a House Panther. Much more deadly when it comes to attacking and snorgling and grappling with a leg or arm when it's time to take a cat nap with the Beans. He was a great and famous Ninja kitten/kitten ninja though. Love the pix of the little ones. you just made my day! but how often have i already written that here on your blog?! I love your words as much as your photos. You are so freakin' awesome.